As we have before observed, there is nothing of importance or out of the usual course of petty crime, incidental to a large and populous city. Of the five persons sentenced to be transported not one was a native of Kilkenny; they were all strangers, and quite unconnected with this neighbourhood. Mary Bagnell, for stealing muslin out of the shop of Mr Finn, of the High-street. This person had been sentenced at the last assizes for a similar crime to 3 months imprisonment–to be transported for seven years. Kaliff Norman and John Sheill, both soldiers of the 70th Regiment, quartered in this town–they were very indifferent characters–sentence same–for stealing silk handkerchiefs from Mr. J.B. Nowlan. The prisoners pleaded guilty. Their officers seemed glad to get rid of those fellows, and offered every facility in bringing them to justice. 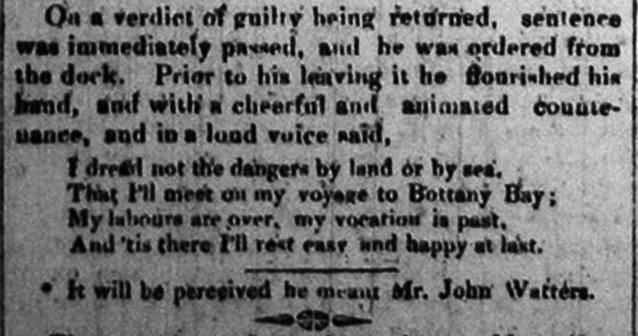 Same sentence on Henry Callaghan, for robbing the Rev. Peter Roe, in St. Mary's Church-yard, of silk a handkerchief–a noted offender. Same sentence on Francis Macnamara, a real Corkonian, for breaking the shop-window of Mr. John Mc Donnell, and stealing therefrom a piece of worsted plaid. The cross-examination of two witnesses by this prisoner afforded much amusement to the court; his peculiar accent, cutting remarks, and mode of delivery, were both quaint and forcible. "Please your Wordship, as to Mr. Prince the constable, his oath should not be thought much against me. He may know the weight of that book in penny weights, but of the awful meaning and substance he knows nothing, often as he may have kissed it. He should have the eye of a hawk, and the vigilance of a cat, to see me do what he swears. By the virtue of your oath, young man, (to the shop man,) did you get directions from any persons as to what you were to swear against me." Answer–" By virtue of my oath I did not." To the constable he put the same question, and received a like answer. "Now your wordship, I must prove them both perjurers : did not that decent looking gentleman* sitting under your wordship, in a loud and distinct manner, that no body could mistake, direct them to swear the truth, the whole truth, and nothing but the truth." And 'tis there I'll rest easy and happy at last. * It will be perceived that he meant Mr. John Watters. Many thanks to Prof. Paschal Preston for organising a printout of the microfilm in Ireland. 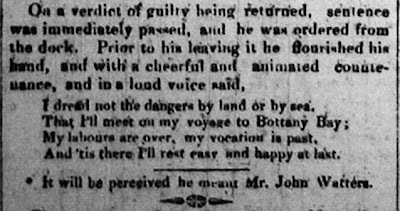 This report of the MacNamara trial in Kilkenny on 14 January 1832 tells us a good deal about his character before he was transported to 'Bottany Bay' as the newspaper spells it. He appears not at all in awe of the court or its proceedings, his 'peculiar accent' seems to allow him to address the Judge as your Wordship and accuse the policeman and shop man of purjory. He is ordered from the dock but before he leaves he loudly proclaims his four line verse. The rhyming of sea in the first line with bay in the verse is an indication of his accent and similar rhymes occur in a number of the verses he composed in Australia. Aged 21 he is not phased by the court but also shows no fear of the voyage and imagines a happy life at the other side of the world. This first published instance of his poetry indicates an accomplished extempore poet, a quality that made him a favourite with fellow prisoners in NSW and Van Diemen's Land, convicts who knew him as 'Frank the Poet'. Only one other example of his poetry was published in his lifetime, all the rest attributed to him were gathered and collected from oral sources, having been committed to memory by some of those who heard him recite his compositions.